In social services, intuition does not always produce results and long-funded programs do not always achieve what we hope. As we realize the complexity of changing people’s lives, evidence has become the watchword. Service providers want to know that their work actually helps those they serve. Governments and other funders want to know that their money accomplishes as much as it can. Measuring outcomes, always a goal, has taken on a new urgency. Pay-for-success is one tool designed to add attention to outcomes. Governments usually pay for a program based on its activities or outputs. Under a pay-for-success agreement, however, the government conditions some or all of its money on the program’s outcomes. 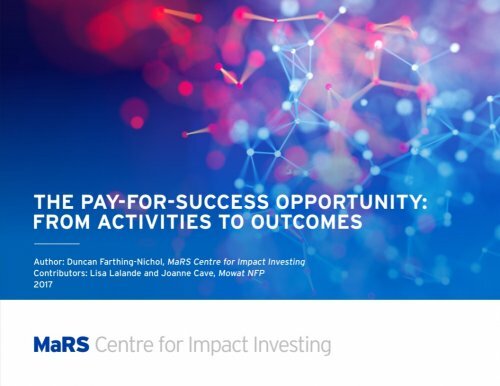 By writing into the funding contract that dollars will depend on the service provider’s results, pay-for-success puts evaluation front and centre. This paper: 1. Defines pay-for-success. 2. Discusses the promises and cautions of pay-for-success, and sketches the close relation between the difficulties that bedevil pay-for-success and those that hinder program evaluation writ large. 3. Raises a few problems that governments must manage if they wish to foster pay-for-success. What is a pay-for-success agreement? How does a pay-for-success agreement differ from a conventional funding agreement? Where has pay-for-success operated in Canada?